For years, Rudolph the Red-Nosed Reindeer has brightened the holidays! Celebrating the special place it holds the hearts of Christmas lovers, Jim Shore reimagines the film's most iconic scenes in his signature folk art style. This happy reindeer is the cutest misfit we've ever seen! Wrapped in a quilt-patterned scarf, Rudolph smiles eagerly as his red nose glows. It actually lights up with watch battery included! 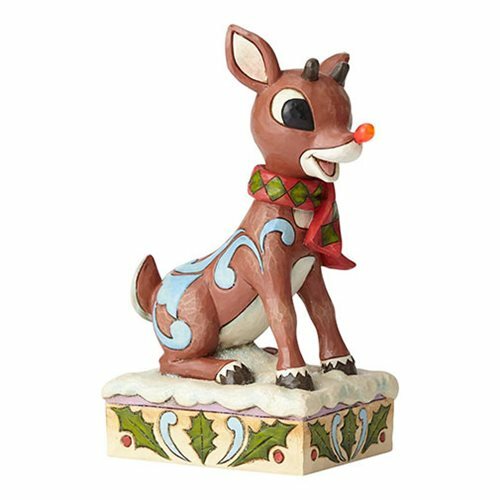 This statue is handcrafted from high-quality stone resin and hand-painted, making each as one-of-a-kind as Rudolph himself. The Rudolph the Red-Nosed Reindeer Rudolph with Light-Up Nose Statue by Jim Shore measures about 7-inches tall x 4 3/4-inches long x 3 1/3-inches wide.